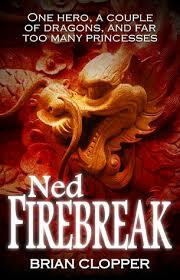 I had the privilege of reading Brian Clopper's manuscript for Ned Firebreak as a beta (early) reader an am pleased to report that I thoroughly enjoyed it. Fast-paced and highly readable, this novel sets up the adventures of the Firebreak family, fearsome dragonslayers who earn their living rescuing princesses from those terrifying beasts of legend. Clopper layers in a healthy dose of his comic wit, nicely balancing comedic scenes and moments with some truly exciting action sequences. I can easily see "Ned" becoming the first book of a series and hope that the author intends to do just that. Recommended. About Brian Clopper: "I am a 5th grade teacher in North Carolina whose comic book work has garnered praise from the likes of Lincoln Child, Mark Crilley and Piers Anthony. One of my projects, IMAGINATION ROCKET, even received an Eisner nomination. I have done numerous author talks on brainstorming with odd pairings, changing expectations and randomizing through both public schools and libraries."